The front vowels in Malayalam are / i, i:, e, e:/. Of these two are short vowels /i,e/ and two are long vowels /i:, e:/. The four front vowels have an on glide ‘y’ in the initial position and an off glide of ‘y’ in the final position. This general statement is not repeated in the allophonic statement. Their allophones and their distribution are as follows (Velayudhan Asari 1970). /i/ High front unrounded tense vowel. [I] Lower high front unrounded vowel occurs in the environment c-c.
[i] High front unrounded tense vowel occurs elsewhere. 2. /i:/ High front unrounded tense long vowel. [i:] High front unrounded tense long vowel occurs initially, medially and finally. 3. /e/ Higher-mid front unrounded short vowel. [Σ] meanmid front unrounded vowel occurs in the environment c-c.
[e] Highermid front unrounded short vowel occurs elsewhere. 4. /e:/ Highermid front unrounded long vowel. /e:/ Highermid front unrounded long vowel occurs initially, medially and finally. /po:re:/ [po:re:] ‘(is it) not enough’?. In Hindi all the vowels which are preceded or followed by a nasal consonant are generally nasalized. This general statement is not repeated in the allophonic distribution. Their allphonic distribution is as shown below. 1. /i/ High, front, unrounded short vowel. [Ĭ] extra short vowel occurs word initially before s+c, word finally and elsewhere after c1+c2. [i] Lower-high front little centralized short vowel occurs elsewhere. /i:/ High front, unrounded long vowel. [i:] High, front, unrounded long vowel occurs word finally. 3. /e:/ Lower-mid front unrounded long vowel. [e:] Lower-mid front unrounded long vowel occurs initially. 4. / æ: / Higher low, front unrounded long vowel. [ æ:] Higher low, front unrounded long vowel occurs initially. [ æ·] Higher low, front unrounded little centralized, half long vowel occurs elsewhere except before y. [∂I] a diphthong beginning with [∂] and gliding of towards [ I] occurs when followed by /y/. The front vowels /i:, e:/ show similarity in both Malayalam and Hindi. The front short vowel /i/ show partial similarity. When compared with the Malayalam /i/ Hindi /i/ is a little centralized and extra short. The front short vowel /e/ is found only in Malayalam. The vowel /æ:/ is found in Hindi only. The central vowels in Malaylam are /∂, a, a: /. 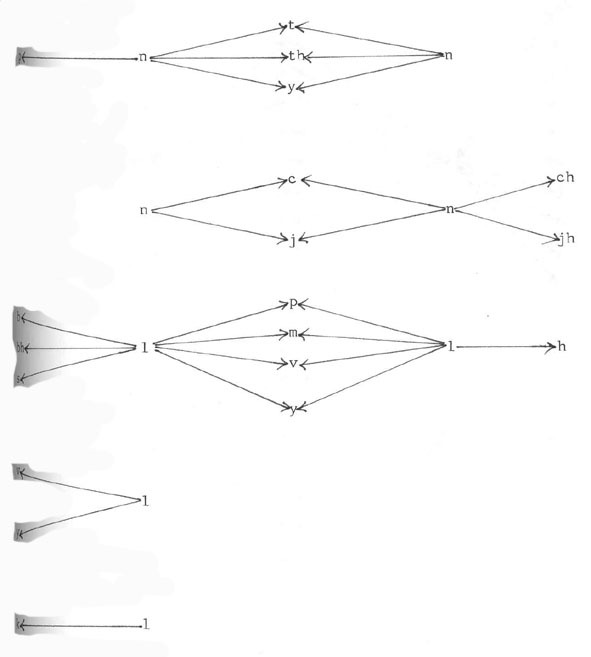 Their allophonic distributions are as follows. 1) /∂ / Mean - mid central unrounded vowel. [∂] Mean-mind central unrounded vowel occurs word finally. 2. /a/ Low central unrounded short vowel. [a] Low back unrounded vowel occurs elsewhere. 3. /a:/ Low central unrounded long vowel. [a:] Low central unrouinded long vowel occurs word initially, medially and finally. The two central vowels in Hindi are /∂, a:]. Their allophonic distribution is shown below. 1) /∂ / Mean -mind, central unrounded vowel. [Σ ] Mean -mid front more centralized unrounded short vowel occurs before /h/ + /c/ or before final /h/ or before /h/ not followed by a vowel. [∂] Mean-mid central unrounded short vowel occurs elsewhere. 2) /a:/ Low central unrounded long vowel. [a:] Low central unrounded long vowel occurs initially and medially. [a•] Low central, little higher than [a:] half long occurs elsewhere. The central vowel /a:/ is similar in both Malayalam and Hindi. The vowel phoneme /∂/ which is a central unrounded vowel is found only in Malayalam. The four back vowels in Malayalam are /u, u:, o, o:/. These vowels have an on glide of `w’ initially and an off glide of `w’ finally. This general statement is not repeated in the allophonic statements. 1. /u/ High back rounded short vowel. [υ] High back unrounded vowel occurs in the environment c-c except in word initial syllables. [u] High back rounded tense vowel occurs elsewhere. 2. /u:/ High back rounded long vowel occurs word initially, medially and finally. 3. /o/ Higher -mid back rounded vowel. [o] Higher -mid back rounded short vowel occurs word initially and medially. 4. /o:/ Higher - mid back rounded long vowel. [o:] Higher -mid back rounded long vowels occurs word initially, medially and finally. 1. /u/ High back slightly rounded short vowel. [u] High back slightly rounded little centralized extra short vowel occurs elsewhere. 2. /u:/ High back slightly rounded long vowel. [u:] High back slightly rounded long vowel occurs initially and medially. [u’] High back slightly rounded little centralized half-long vowel occurs elsewhere. 3. /o:/ Higher -mid, back rounded long vowel. [o:] Higher-mid back rounded long vowel occurs word initially. [o’] Higher mid back little centralized half-long vowel occur elsewhere. 4. / >:] Higher-low back rounded long vowel. [ ë:] Higher-low back rounded long vowel occurs word initially and medially. [ ∂U] a diphthong beginning with [∂] and gliding off towards [U] occurs when followed by a /v/. /cë:va:/ [c∂Uva:] ‘thread wound on fore fingers’. The vowel phonemes /u:/ and /u/ of Malayalam are partially similar to Hindi phonemes /u:/ and /u/. In Malayalam they are rounded and high but in Hindi they are slightly rounded a little centralized. The short bck vowel /o/ is found only in Malayalam. The vowel /ë:/ is found only in Hindi. In Malayalam sub phonemic length is not indicated in the transcription. There are three degrees of phonetic duration in Malayalam - extra short, short and half-long but which do not have much significance in Malayalam language. Only two degrees of length short and long need to be recognized in Malayalam. But in Hindi this character of vowel is taken care in the allophonic level since they have a major role in determining the vowel quality. Nasalization of vowel is a peculiarity of Hindi vowels. There are two types of nasalization of vowels in Hindi, one allophonic and the other phonemic. Allophonic nasalizaion is automatic so it is mostly not marked in writing. In Hindi the vowels after or before a nasal consonant are generally nasalized. This sort of nasalization is found in Malayalam also but it is ignorable. Phonemic nasalization has only a restricted distribution, it may even be considered as a part of the secondary vowel system of Hindi. In Malayalam vowels there is no complex diphthongs or diphthongzing of long vowels. The two diphthongal articulations to be distinguished in Malayalam are symbolized as /ai/ and /au/. These are not given phonemic status because their occurrence is very limited and sometimes may be replaced by the continuants y or v.
In Hindi also the short Sanskrit diphthongs /ai/ and /au/ are replaced by /æ:/ and />:/. [b] Bilabial voiced lenis fricative occurs intervocalically. [ b] Bilabial voiced stop with a gradual trailing in voicing occurs medially after homorganic nasal. [P] Bilabial voiceless fortis stop occurs elsewhere. [bh] Bilabial semi voiced aspirated stop with a slight friction occurs intervocalically. [bh] Bilabial voiced aspirated stop with a gradual trailing in voicing occurs medially after homorganic nasal. [ph] Bilabial voiceless aspirated stop occurs elsewhere. 3. /b/ Bilabial voiced stop. [b] Bilabial voiced stop occurs initially and medially. [D] Dental voiced lenis fricative occurs intervocalically. [D] Dental voiced stop with a gradual trailing in voicing occurs medially after homorganic nasal. [t] Dental voiceless stop occurs elsewhere. [Dh] Dental voiced affricate occurs intervocalically. [Dh] Dental voiced aspirated stop with a gradual trailing in voicing occurs medially after homorganic nasal. [th] Dental voiceless aspirated stop occurs elsewhere. 6. /d/ Dental voiced stop. [d] Dental voiced stop occurs initially and word medially with length or in clusters. (7) /R/ Alveolar voiceless stop. /d/ Alveolar voiced stop occurs the homorganic nasal. [t] Alveolar voiceless stop occurs with length medially. [R] Alveolar trill occurs elsewhere. 8. /T/ Retroflex voiceless stop. [D] Retroflex voiced stop with less duration occurs intervocalically. [D] Retroflex voiced stop with a gradual reduction in voicing occurs medially after a homorganic nasal. [T] Retrofelx voiceless stop occurs elsewhere. 9. /Th/ Retroflex voiceless aspirated stop. /Dh / Retroflex voiced aspirated stop with a friction occurs intervocalically. [Dh] Retroflex voiced aspirated stop with a reduction in voicing occurs after the homorganic nasal. [Th] Retroflex voiceless aspirated stop occurs elsewhere. 10. /D/ [D] Retroflex voiced stop occurs initially and medially. 11. /c/ Palatal voiceless stop. [j] Palatal voiced stop with a slight friction occurs intervocalically. [j] Palatal voiced stop with a gradual reduction in voicing occurs medially after the homorganic nasal. [c] palatal voiceless stop occurs elsewhere. 12. /ch/ palatal voiceless aspirated stop. [ch] palatal voiceless aspirated stop occurs word initially and medially. 13. /J/ palatal voiced stop. [J] palatal voiced stop occurs initially and medially. [G] Velar voiced stop with slight friction occurs inter-vocalically and after y and v.
[G] Velar voiced stop with a reduction in voicing occurs medially after homorganic nasal. [k] Velar voiceless stop occurs and initially and medially not after nasals, y and v.
15. /kh/ Velar voiceless aspirated stop. [Gh] Velar voiced aspirated stop with a fricative quality occurs intervocalically. [Gh] Velar voiced aspirated stop with a gradual reduction in voicing occurs medially after the homorganic nasal. 1. /p/ Bilabial voiceless stop. [p’] Bilabial voiceless unreleased stop occurs finaly after a vowel and elsewhere before a consonant. [p‘] Bilabial voiceless released stop occurs finally after a consonant. [p.’] Bilabial voiceless unreleased relatively long stop occurs medially before /y/, /r/, /l/ and after a vowel. [p] Bilabial voiceless stop occurs elsewhere. 2. /ph/ Bilabial voiceless aspirated stop. [ph ] bilabial, voiceless, lightly aspirated released stop occurs word finally. [p.’h] Bilabial, voiceless, lightly aspirated, unreleased, relatively long stop occurs medially before /r/ and after a vowel. [b’] Bilabial, lightly voiced unreleased stop occurs finally after a vowel and elsewhere before a consonant. [b‘] Bilabial lightly voiced released stop occurs finally after a consonant. [b.’] Bilabial, lightly voiced, relatively long unreleased stop occurs medially before /r/ and after a vowel. [b] Bilabial, voiced, unaspirated stop occurs elsewhere. 4. /bh/ Bilabial voiced aspirated stop. [bh‘] Bilabial, voiced, lightly aspirated released stop occurs word finally. [b.’h] Bilabial, voiced, lightly aspirated relatively long unreleased stop occurs medially before /r/ or /y/ and after a vowel. [bh’] Bilabial, voiced, lightly aspirated unreleased stop occurs before a consonant. [bh] Bilabial, voiced aspirated stop occurs elsewhere. [t’] Dental, voiceless, unreleased stop occurs finally after a vowel and elsewhere before a consonant. [t‘] Dental, voiceless released stop occurs finally after a consonant. [t.’] Dental voiceless, relatively long unreleased stop occurs medially before /y/, /r/, /v/ and after a vowel. [t] Dental voiceless, stop occurs elsewhere. 6. /th/ Dental, voiceless aspirated stop. [th‘] dental, voiceless, lightly aspirated released stop occurs word finally. [t.’h] Dental, voiceless, lightly aspirated relatively long unreleased stop. Occurs medially before /v/ and /y/ and after a vowel. [th’] dental voiceless aspirated unreleased stop occurs before a consonant. [th’] dental voiceless aspirated stop occurs elsewhere. /d’/ dental voiced unreleased stop occurs finally after a vowel and elsewhere before a consonant. [d‘] dental slightly voiced released stop occur after a consonant. [d.]Dental voiceless relatively long unreleased stop occurs medially before /r/, /v/, /y/ and after a vowel. [d] Dental voiced unreleased stop occurs elsewhere. 8. /dh/ Dental voiced aspirted stop. [dh‘] dental, voiced, lightly aspirated released stop occurs word finally. [dh’] dental, voiced aspirated unreleased stop occurs before a consonant. [d.’h] dental, voiced, lightly aspirated relatively long unreleased stop occurs medially before /v/, /r/, /y/ and after a vowel. [dh] dental, voiced aspirated stop occurs elsewhere. 9. /T/ post-alveolar, voiceless stop. [T’] post-alveolar, voiceless unreleased stop occurs finally after a vowel and elsewhere before a consonant. [T‘] post-alveolar, voiceless, released stop occurs finally after a consonant. [T.’] post-alveolar, voiceless, relatively long unreleased stop occurs medially before /y/ and after a vowel. [T]post-alveolar, voiceless stop occurs elsewhere. (10) /Th/ post-alveolar, voiceless, aspirated stop. [Th‘] post-alveolar, voiceless, lightly aspirated released stop occurs word finally. [Th] post-alveolar, voiceless, aspirated stop occurs elsewhere. 11. /D/ post-alveolar, lightly voiced stop. [D’] post-alveolar, lightly voiced, unreleased stop occurs finally after a vowel or before a consonant. [D‘] post-alveolar, lightly voiced, relatively long unreleased stop occurs medially before /y/ and after a vowel. [D] post-alveolar, voiced stop occurs elsewhere. 12. /Dh/ post-alveolar voiced stop. [Dh‘] post-alveolar, voiced lightly aspirated released stop occurs word finally. [D.’h] post-alveolar, voiced, lightly aspirated unreleased stop occurs medially before /y/ and after a vowel. [Dh] post-alveolar, voiced aspirated stop occurs elsewhere. [c’] palatal voiceless unreleased stop occurs finally after a vowel and elsewhere before a consonant. [c‘] palatal voiceless released stop with slight friction occurs finally after a consonant. [c. '] palatal voiceless unreleased, relatively long stop occurs medially before /y/ and after a vowel. [c] palatal, voiceless, unreleased stop with slight friction occurs elsewhere. 14. /ch/ palatal, voiceless, aspirated stop. [ch‘] palatal voiceless, lightly, aspirated stop released with a friction occurs word finally. [ch’] palatal, voiceless, lightly aspirated unreleased stop occurs before a consonant. [c’.h] palatal, voiceless, aspirated, relatively long, unreleased stop occurs medially before /v/ and after a vowel. [ch] palatal, voiceless, aspirated stop released with friction occurs elsewhere. [j’] palatal, voiced, unreleased stop occurs finally after a vowel, elsewhere before consonant. [J‘] palatal, voiced, released stop with slight friction occurs finally after a consonant. 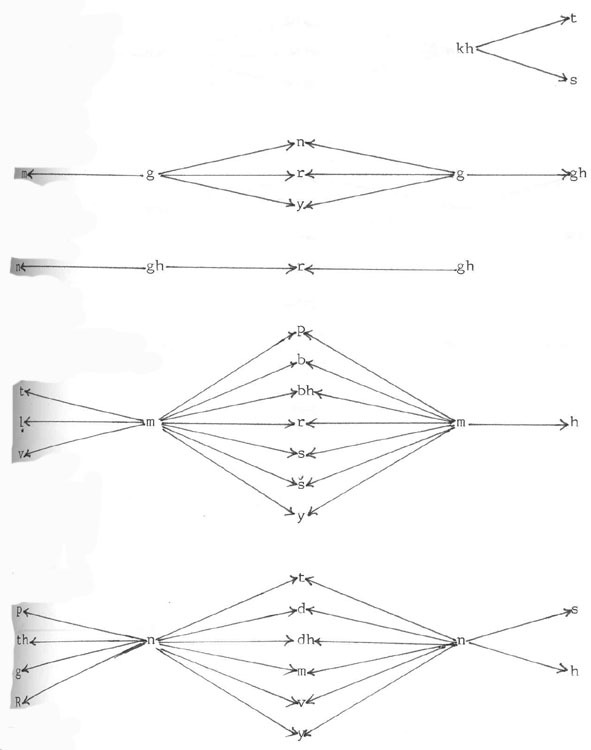 [j.’] palatal, voiced, unreleased relatively long stop occurs medially before /r/, /v/, /y/ and after a vowel. [j] palatal, voiced stop, released with a friction occurs elsewhere. [jh‘ ] palatal voiced lightly aspirated stop released with friction occurs finally. [jh ] palatal, voiced asirated stop released with friction occurs elsewhere. [k’] velar, voiceless, unreleased stop occurs finally after a vowel. Elsewhere before a consonant. [k‘] velar, voiceless, released stop occurs finally before a consonant. [k.’] velar, voiceless, unreleased, relatively long top occurs medially after /l/, /r/, /v/, /y/ and before a vowel. [k] velar, voiceless stop occurs elsewhere. 18. /kh/ velar, voiceless, aspirated stop. [kh‘ ] velar, voiceless, lightly aspirated released stop occurs word finally. [kh’] velar, voiceless, lightly aspirated stop occurs before a consonant. [k.’h] velar, voiceless, lightly aspirated, unreleased relatively long stop occurs medially before /y/ and after a vowel. [kh] velar, voiceless, aspirated stop occurs elsewhere. [g’] velar, voiced, unreleased stop occurs finally after a vowel, elsewhere before a consonant. [g‘] velar, voiced released stop occurs finally after a consonant. [g.’] velar, voiced, unreleased, relatively long stop occurs, medially before r/, /y/ and after a vowel. [g] velar, voiced stop occurs elsewhere. 20. /gh/ velar, voiced aspirated stop. [gh’] velar, voiced, lightly aspirated released stop occurs word finally. [gh’] velar, voiced, lightly aspirated unreleased stop occurs before a consonant. [g.’h] velar, voiced, lightly aspirated, relatively long stop occurs medially before /r/, /y/ and after a vowel. [gh] velar voiced aspirated stop occurs elsewhere. The stop consonants /p, ph, b, t, th, d, c, ch, j, k, kh, g/ are similar in both Malayalam and Hindi. e.g. In Malayalam voiced aspirated stops are found only in the allophonic level. The allophones [bh] of the phoneme /ph/ and [dh] of the phoneme /th/ are voiced aspirated in Malayalam. 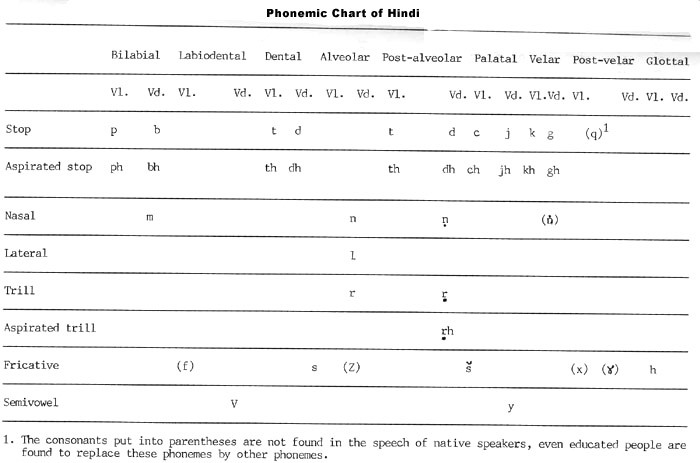 Thus these phonemes are partially similar to Hindi phonemes /bh/ and /dh/ in the allophonic level. The Malayalam phonemes / T, Th, D/ are partially similar to Hindi /T, Th, D/. In Malayalam these sounds are retroflex stops. In Hindi they are post alveolar stops with a very little retroflexion. The alveolar voiceless stop /R/ of Malayalam has no equivalence in Hindi. The stops /Dh, jh, gh, q /are found in Hindi only. Of these the phoneme / q / very rarely occurs in Hindi and is found only in words of Persian origin. In Malayalam there are six nasals. 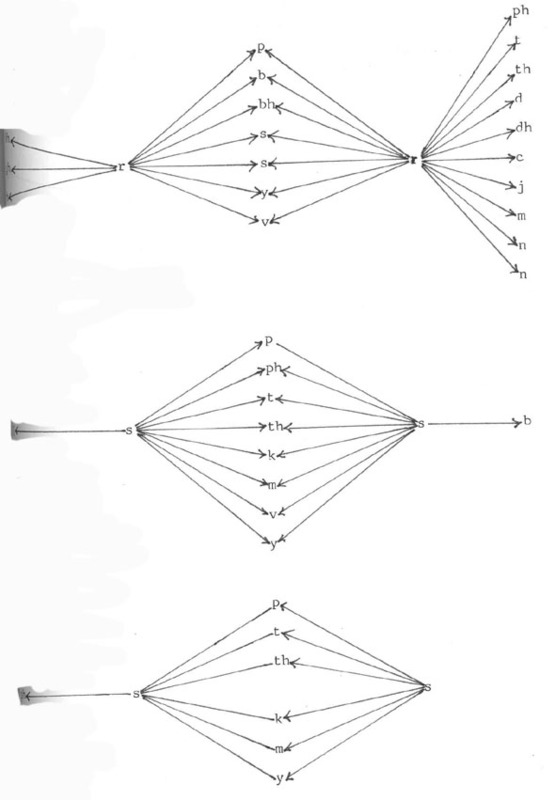 The allophonic distribution of these six nasals are given below. [m] Labio dental nasal occur medially before V.
2. /n/ Dental nasal occurs initially independently and medially in clusters. [n] Alveolar nasal occurs initially before [y], medially and finally. [N] Retroflex nasal occurs medially and finally. [ň] palatal nasal occurs initially and medially. [ŋ] velar nasal occurs medially with length or in clusters. There are four nasal consonants in Hindi. 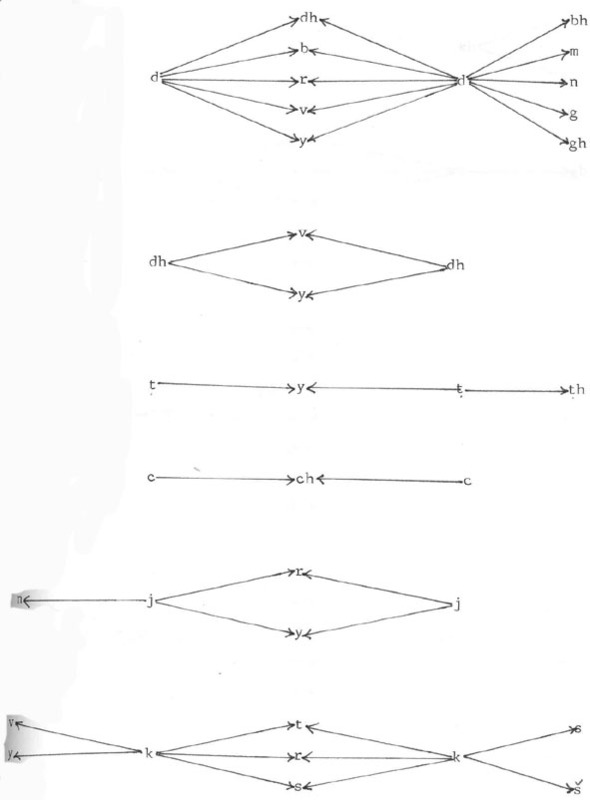 Their occurrence and allophonic distributions are given below. 1. /m/ Bilabial, voiced nasal stop. [m’] bilabial, voiced, orally unreleased nasal finally after a vowel, elsewhere before consonant. [m‘] bilabial , voiced orally released nasal occurs finally after a consonant. [m.’] bilabial, voiced , orally unreleased, relatively long nasal occurs medially before /l/, /r/, /y/ and after a vowel. [m] Bilabial, voiced nasal stop occurs elsewhere. [n’] Alveolar, voiced, orally unreleased nasal occurs finally after a vowel or elsewhere before a consonant. [n‘] Alveolar, voiced, orally realased nasal occurs finally after a consonant. [n.’] Alveolar, voiced, orally unreleased relatively long nasal occurs medially before /v/, /y/ and after a vowel. /N/ post-alveolar, voiced , flap nasal. [N’] post-alveolar, voiced, orally released nasal occurs medially before a post - alveolar stop. [N.’] post alveolar, voiced orally unreleased relatively long, nasal consonant occurs medially before /y, /V/ and after a vowel. [N] post-alveolar, voiced, orally unreleased relatively long, nasal occurs intervocalically and finally. (4). /ň/ [ň] palatal, voiced, orally unreleased nasal occurs medially before palatal consonants. [ŋ] velar, voiced, unreleased nasal occurs finally after a vowel, medially before a consonant. The nasals /m, n, ŋ/ are similar in both Malayalam and Hindi . The dental voiced nasal phoneme /n/ in Malayalam has no equivalence in Hindi. 1. /l/ Alveolar lateral occurs initially, medially and finally. 2. /L/ Retroflex lateral occurs medially and finally. [ļ] prepalatal retroflex lateral with slight friction occurs medially. e.g. : /1/ Alveolar voiced lateral consonant. [1’] Alveolar voiced unreleased lateral occurs finally after a vowel or before a consonant. [1‘] Dental voiced released lateral occurs finally after a consonant. [1.’] Alveolar voiced relatively long, unreleased lateral occur medially before /y/ and after a vowel. Alveolar voiced lateral occurs elsewhere. The alveolar lateral /1/ is similar in both Malayalam and Hindi. The retroflex voiced lateral /L/ and the palatal voiced lateral /ļ / in Malayalam have no equivalence in Hindi. In Malayalam there is only one trill /r/. [r] Alveolar flap with slight trilling occurs initially and medially. The trill consonants present in Hindi are /r, R, Rh/. 1. /r/ Alveolar voiced trilled consonant. [r] Alveolar voiced trilled consonant occurs medially after a consonant. [ l ] Alveolar voiced fricative occurs initially and finally. 2. /r/ post alveolar retroflex flap occurs medially and finally. 3. /rh/ post alveolar voiced lightly aspirated retroflex flap. [rh] post-alveolar voice lightly aspirated retroflex flap occurs medially and finally. Alveolar voiced trill /r/ of Malayalam is partially similar to Hindi /r/ because one of the allophones of Hindi /r/ shows similarity. The post-alveolar voiced trills / r , rh / of Hindi have no equivalence in Malayalam. 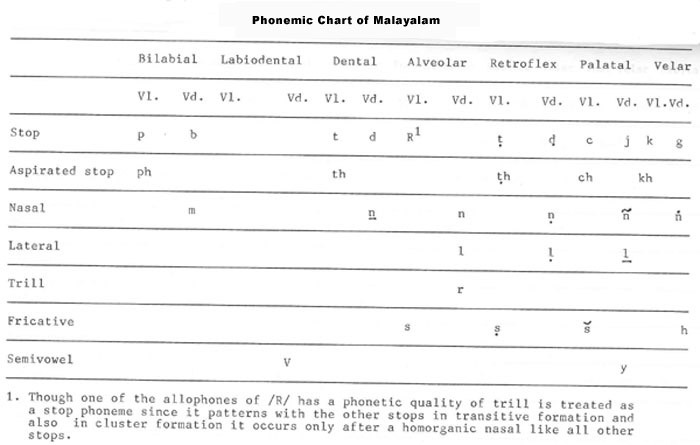 However, one of the allophones of the alveolar voiceless stop /R/ of Malayalam i.e., [R] has similarity with Hindi alveolar trill. [s] Alveolar voiceless fricative occurs initially and medially. 2. /ş / Retroflex voiceless fricative. [ş] Retroflex voiceless fricative occurs initially and medially. 3. / š / palatal voiceless fricative. [ š] palatal voiceless fricative occurs initially and medially. [x] Velar voiceless fricative occurs medially after nasals. [h] Velar voiceless fricative occurs initially and medially. 1. /f / [f] voiceless labio-dental fricative occurs in all positions. 2. / s / Alveolar voiceless, relatively long fricative occurs medially before /1/, /r/, /v/, /y/ and after a vowel. [s] Alveolar voiceless fricative occurs elsewhere. 3./ š / Palatal voiceless fricative. [š.] palatal voiceless relatively long grooved fricative occurs medially before /l/, /r/, /v/, /y/ and after a vowel. [š ] palatal, voiceless grooved fricative occurs elsewhere. 4. /z/ [z] pre-palatal voiced fricative occurs in all positions. [h] Glottal frictionless occurs finally. [ h ] Glottal frictionless continuant occurs finally. The fricatives /s/ and /š / are similar in both Malayalam and Hindi. Fricative /s/ is present only in Malayalam /h/ in Malayalam is voiced velar fricative whereas that in Hindi is voiced glottal fricative. The sound / f / is present in Malayalam but it is restricted to a few English words borrowed to Malayalam and that too amongst the educated people and hence not considered as a separate phoneme in Malayalam. 1. /v/ Labio-dental voiced continuant. [v] Labio-dental voiced continuant occurs initially and medially. 2. /y/ [y] palatal voiced continuant occurs initially medially and finally. The two semivowels of Hindi are /v, y /. 1. /v/ labio-dental voiced frictionless continuant. [w] Bilabial voiced frictionless continuant occurs medially after a consonant. [U] Devoiced, Back, Short, non-syllabic vowel occurs finally after a vowel. [V.] labio-dental voiced, frictionless continuant occurs elsewhere. 2. /Y/ palatal voiced frictionless continuant. [y] Palatal voiced, frictionless continuant occurs everywhere. The two semivowels /v, y/ are similar in both Malayalam and Hindi. In both Malayalam and Hindi consonant clusters are found in the initial and medial positions. Word final clusters are found only in Hindi. Vowel clusters are found only in Hindi. In Hindi vowel clusters are found in the word initial, medial and final positions. These vowel clusters in pronunciation may be replaced with y or v, but in standard writing system they are retained as sequence of vowels only. In Malayalam clustering of vowels does not exist. Initial consonant clusters are found both in Malayalam and Hindi. The presence of initial consonant clusters is limited when compared to the medial clusters. The predominant pattern of initial consonant cluster is C1 C2 in both the languages. In the initial position C1 C2 C3 type is also found in both Malayalam and Hindi but its number is very limited. The major patterns found in the initial two consonant clusters are stop + trill, stop + lateral, nasal + semivowel, fricative + stop, fricative + nasal, fricative + lateral, fricative + trill, fricative + semivowel, semivowel + trill, semi-vowel + semivowel in both Malayalam and Hindi. Thus in the initial position when stop is the first member, the second member can be trill, lateral, fricative or semivowel and when fricative is the first constituent stop, nasal, lateral, trill, fricative or semivowel can occur as the second constituent in both the languages. When semivowel occurs as the first constituent the second consonant may be a trill or a semivowel. In the word initial position with Nasal as first constituent, two types of clusters are found in both Malayalam and Hindi. They are similar in both the languages. In both Malayalam and Hindi initial three-consonant cluster patter is same (C1 C2 C3). Occurrence of initial three-consonant cluster is very limited in both the language. In both the languages the number of word medial clusters are more than that of initial clusters. The common pattern of clusters in the medial position is C1C2. Three-consonant clusters are also found in the medial position in both Malayalam and Hindi. The major types of medial two-consonant clusters found in both Malayalam and Hindi are Stop + Stop, Stop + Nasal, Stop + Trill, Stop + Fricative, Stop + Semi-vowel, Nasal + Stop, Nasal + Nasal, Nasal + Lateral, Nasal + Trill, Nasal + Fricative, Nasal + Semi-vowel, Lateral + Stop, Lateral + Nasal, Lateral + Fricative, Lateral + Semi-vowel, Trill + Stop, Trill + Fricative, Trill + Semi-vowel, Fricative + Stop, Fricative + Nasal, Fricative + Lateral, Fricative + Trill, Fricative + Semi-vowel and Semi-vowel + Semi-vowel. Clusters found only in Malayalam. Similar word medial two consonant clusters with nasal as first constituent. E.g. Word medial two-consonant clusters with nasal as first constituent. Examples of dissimilar clusters. Clusters present only in Malayalam. Examples of dissimilar word medial two-consonant clusters with lateral as first member. Word medial two-consonant clusters with trill as first constiuent. Word medial two-consonant clusters with fricative as first constituent. Word medial two-consonant clusters with semivowel as first constituent. Word medial three-consonant clusters are found both in Malayalam and Hindi. In Malayalam and Hindi the most common pattern is C1C2C3. But in Malayalam C1C1C2 and C1C2C2 type are also present in addition to C1C2C3 type. In Malayalam there is no word final clusters. Word final clusters are found in Hindi only and in Malayalam they are totally absent. In Hindi the maximum number of constituents that can join together to form word final consonant cluster is there. The nucleus of a syllable is constituted by any vowel, short or long. There are as many syllables in a word as there are vowels. In Malayalam complex peaks are absent whereas in Hindi it is only allophonic. In Malayalam the coda of a syllable will contain only a single consonant but in Hindi coda contains one or more consonants. In both languages a minimum syllable contains the nucleus only. 1. Low pitch and a falling terminal. 3. Mid pitch and a level terminal occurs in the middle of an utterence. In Malayalam the pitch level /4/ i.e. extra high pitch occurs with vocatives. 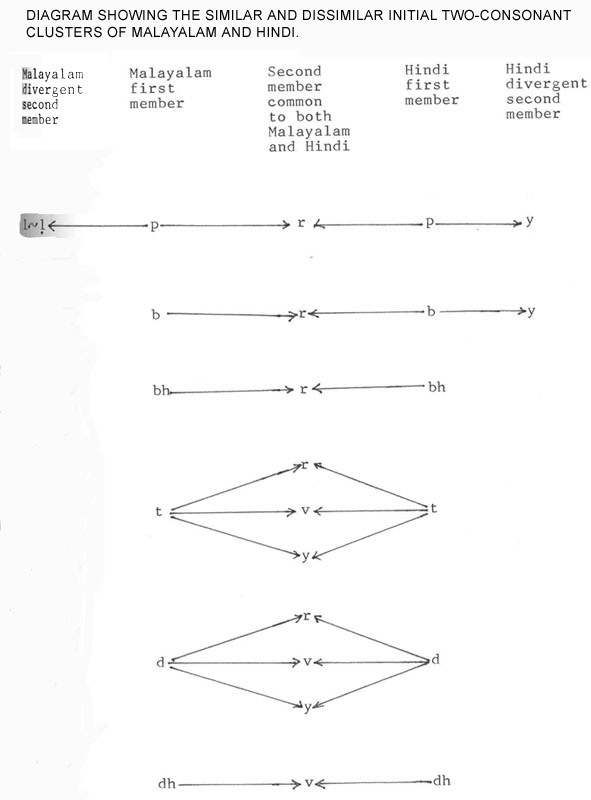 In Hindi the rhythm unit coincide with the intonation contour and these units are bound by terminal junctures or silence. Hindi intonation has four pitch levels and three terminal contours. The most commonly used intonation pattern is / (2) 3 1 / in Hindi. The level contour in Hindi is used mostly to express angry tone. 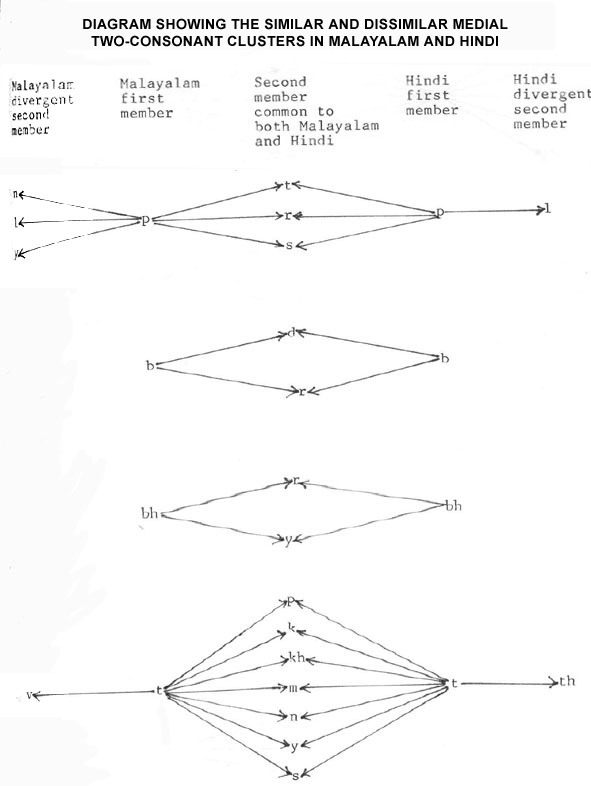 Intonation is defined as the variation which takes place in the pitch of the voice in connected speech. In both Hindi and Malayalam the intonation, have four pitch levels and three terminal contours. They are pitch levels – Extra high, High, Mid and Low and terminal contours – rising, falling and level. In both Malayalam and Hindi extra high pitch is used and it occurs with vocatives. Juncture marks the word-boundary in a sentence. However, in Malayalam there exist two types of significant word junctures – close juncture (+) and open juncture (-). In Hindi juncture marks the word boundary in a sentence. In both Malayalam and Hindi juncture marks the word boundary in a sentence and its distribution is mostly similar except for the fact that Malayalam distinguishes two types of low junctures.